The SalesBO cloud service is web-based management, statistics and analysis service for cash register sales. Administer the users of the service, sales representatives, products and prices through the web-based control interface. SalesBO cloud service allows near real-time cash register sales monitoring in and easy, safe and realiable way independent of time or place. "For all the merchants, chain managers, store supervisors and supervisors of financial departments who want to improve their workflow and business." SalesBO stands for Sales Back Office. SalesBO is a back office system that will keep a record of the sales transactions with a wide range of reports produced. See the description of Back office at wikipedia. 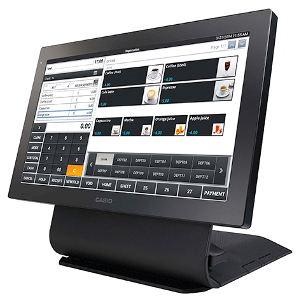 SalesBO cloud is suitable for any business your compatible POS terminal is suitable. For business owners and store supervisors it is a prerequisite to be able to manage and monitor sales with browser in computer or tablet device, independent of time or place. SalesBO cloud provides electronic journals, charts and wide range of reports, all collected from your POS terminals from anywhere, into one central service. You can monitor your daily sales near real-time from the dashboard. Besides monitoring, you can easily manage your products, prices, taxes, sales clerks and much more. Any modifications you make on cloud are synchnorized to connected POS terminals. Available with SalesBO Premium. Products are automatically reduced from stock when sold, with reference to receipt number. Stock management also supports recipe products such as drinks. There is an easy-to-use inventory tool for calculating stock value. SalesBO cloud connects your Casio POS terminals to an easily manageable entity. The main advantage of SalesBO cloud is that you can continue using the reliable POS software provided by Casio on your terminal. Our solution does not alter the operation on the terminal and therefore requires no extra training for the sales clerks. 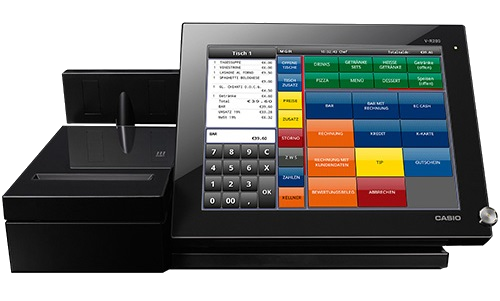 You can connect compatible Casio V-R series POS terminals *) to SalesBO cloud with ease. With our add-on application everything is done automatically on the background. After our application is installed on the terminal and has been registered to the cloud, it will start synchronizing sales receipts to the SalesBO cloud. Besides sales receipts, it will sync your products, taxes, clerks, electronic journals and much more! The synchronization works in both directions. That means any modifications you make on the SalesBO cloud are synchnorized back to connected POS terminals. Connecting your POS terminal to the SalesBO cloud does not delete sales information stored in the POS terminal, thus still allowing the individual extraction of reports from the POS terminal as you have used to. With Premium, you get more advanced features such as ability to backup your Casio terminal to the cloud. SalesBO Basic is now available now from your nearest Casio retailer in Denmark, Finland, Italy, Norway and Sweden. The SalesBO cloud service for POS terminals consists of the following service level specific features.